Father of Twins: The boys' first birthday! Friday the boys turned one year old! It is really hard to believe that the boys are already one. It is crazy to see much they have grown and all they do now in just a year's time. Both of them used to sit nicely next to each other on a single couch cushion. Now they are sleeping in their own cribs. They're walking, Jacob is mastering running, they are talking, laughing, mimicking. I took the day off work and we all headed to the Akron zoo in the morning. I had thought we'd have the place to ourselves but instead it seemed every school district was having a field trip to the zoo. The place was packed!! We ended up doing a quick run through. After the zoo, we headed to toys r us to get two new convertible car seats for our ever growing boys. They have so much more room in their new seats and eventually will have a cup holder added. After dinner, they each had their own cake to dig in to. Joy had made little cakes with strawberry shorting. 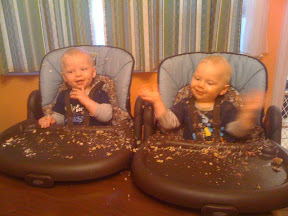 They both loved it and made giant messes. Their birthday concluded with a viewing of their favorite movie, Mary Poppins. The Beginning of a Busy Month!